Orthodox church dedicated to the Beheading of St. John the Baptist in the village of Samodreza near Vucitrn, was desecrated and turned into a garbage dump. The altar of this Serbian shrine, built on the place where Prince Lazar received communion with the army before the Battle of Kosovo, Albanian children turned into a public toilet, writes “Kurir”. All attempts to stop the desecration of the Orthodox church were unsuccessful because the Albanian population is against its renewal. 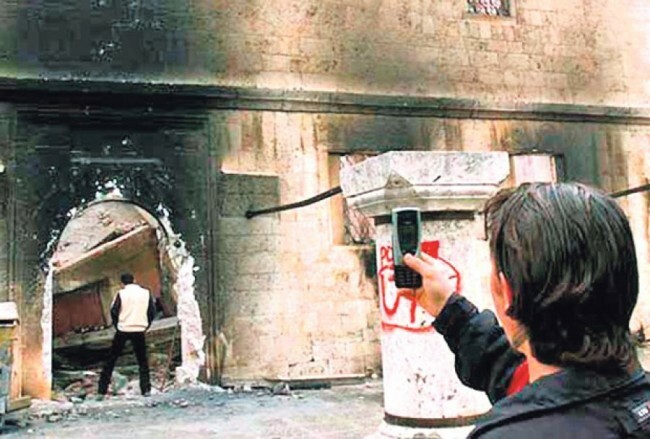 The church was burned, vandalized and desecrated for the first time in 1999 after international forces arrived in Kosovo, writes the daily. The roof of the church was destroyed, windows and the metal door on it broken, and over the apse a large hole was breached. The interior of the church is turned into a public garbage dump and a toilet in which people and the cattle relieve, writes “Kurir”. The wall around the church is destroyed. This Orthodox church is literally cluttered with garbage, according to the daily. “The holy temple was destroyed back in 1999, and in recent years Albanian children keep throwing garbage in it. We tried several times to stop the further desecration through the international community and proposed placement of brass doors and windows, but the Albanian community opposes renewal,” said Bishop of Raska and Prizren Teodosije for “Telegraf”.